Finally, the leftovers from Christmas as herrings, gravlax, meatballs are gone and I am starting to cook again. We continue with our daily hikes and I need to serve the meal pretty fast after we returned home.... which means a little bit of planning. 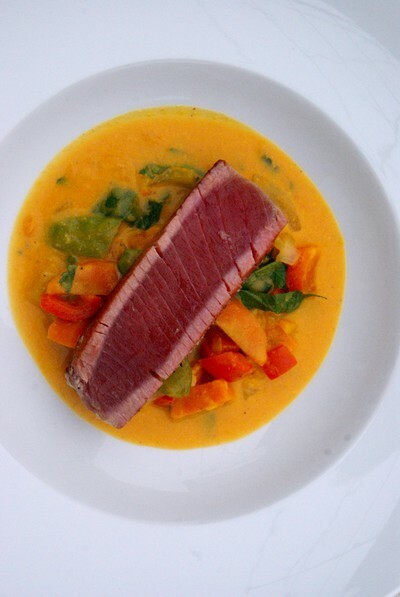 During the night I defrosted a nice piece of tuna fish in order to serve it with my vegetable and coconut milk stew. For the stew I am using the vegetables available in my fridge but the variation is endless. 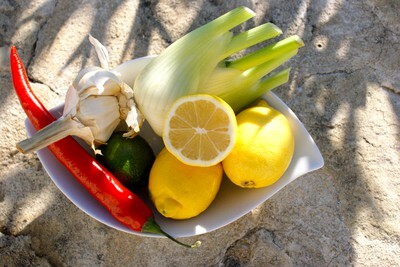 Cook onion and garlic in olive oil and after a while add all vegetables and stir additionally for a few minutes. Add tomato paste, turmeric and grated ginger. Pour over a little of water, white wine and add chicken stock cube. Cook for 15min. Add coconut milk and continue to cook for 5 min. Before serving add the chopped parsley and season it with pepper, salt and lemon juice. Pan-fry the tuna fish from both sides leaving the middle raw. 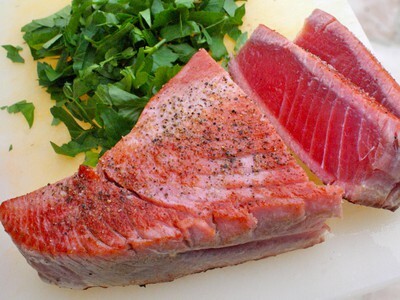 Serve thick slices of fish on top of the stew. Our Christmas food is a marriage of flavors. 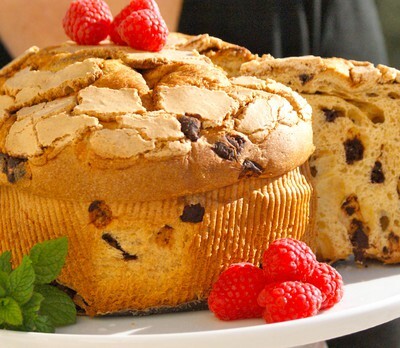 We enjoy the traditional Swedish smorgasbord as well as the seasonal access to tropical fruits and also some other favorites like the Italian cake, Panettone. However, the most important is that my small family gather around the table and that we share together the food, the memories and the plans for the future. 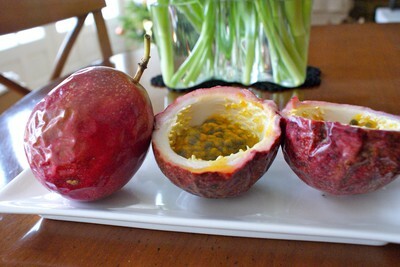 Passion fruit and Papaya are my favorite fruits and they are often available in the shops around Christmas. 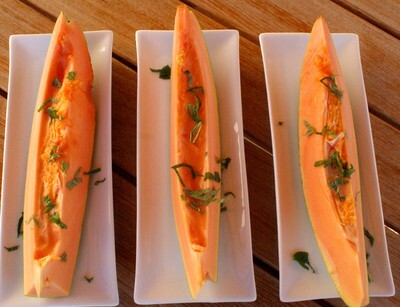 I serve Papaya often for breakfast. 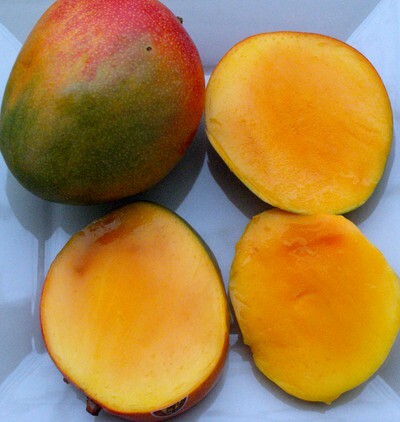 It is delicious when ripe and orange-coloured. 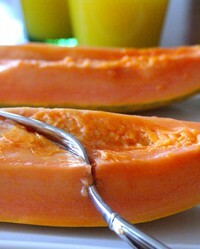 Papaya is a wonderful digestive aid because of a powerful enzyme called papain. As its colour suggests, papaya is full of beta carotene, as well as vitamin C.
According to the Swedish tradition the meal on Christmas Eve is followed by singing. 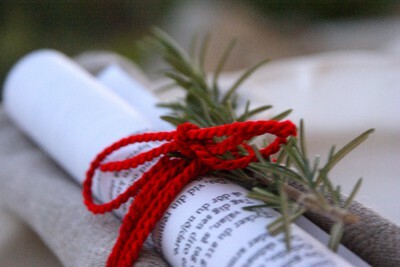 Therefore my husband prepared a sheet of paper with lyrics to each of us and I included it in the table decoration. 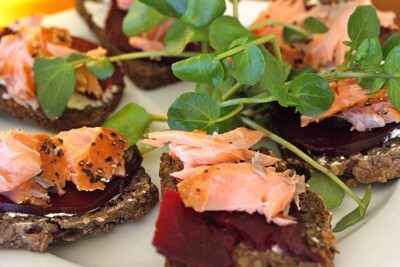 The gravlax I described in my earlier blog was the absolute favorite on the table. We served it together with the mustard sauce bought at IKEA. 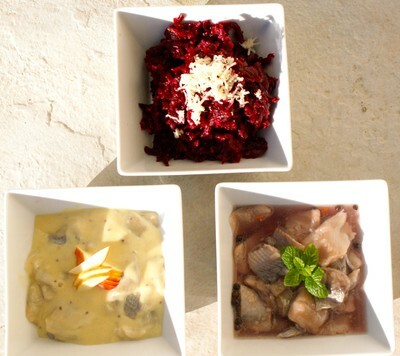 Herring in different marinades and small glass of snaps are also given components on our Christmas table. 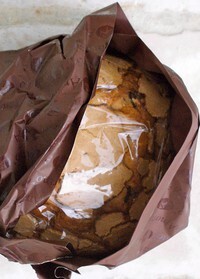 I learned to appreciate Panettone when I lived in Switzerland. There I could buy it from small Deli shops with focus on quality rather than quantity. 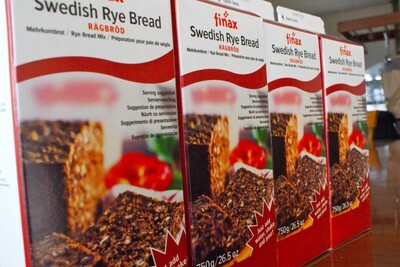 I could not believe that it was the same cake I used to buy in Sweden, baked by huge industries in Italy and exported to the entire world. 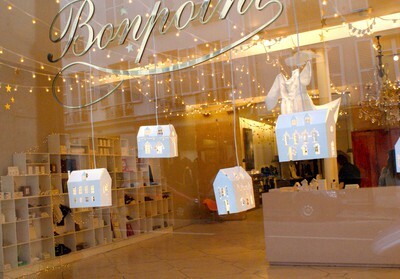 Therefore I was happy when i discovered in Paris a small luxury chocolate shop, which also sold high quality Panettone.....this time with chunks of chocolate inside. If you're wearing lingerie that makes you feel glamourous, you're already halfway to turning heads. And it's so true. Lingerie makes you to focus on body. You feel sensual. So wear lingerie for you, to feel good about your self. 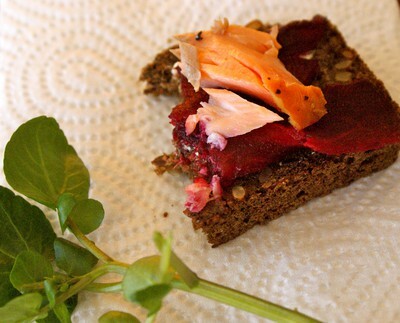 This is probably THE dish that put Swedish food on the international culinary map. There is no smorgasbord without it and in for our family it wouldn't be Christmas without it. 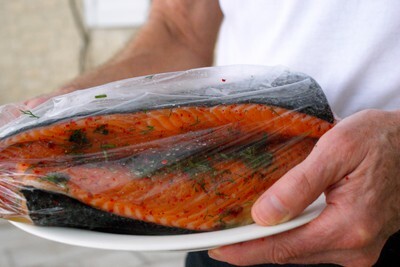 The process takes a couple of days as the salmon needs to be turned on all sides in the marinade before it is ready to be sliced and plated. 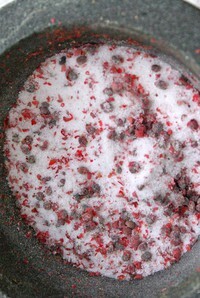 Mix sugar, salt and pepper and pat the mixture properly into the fish. Pour the cognac over and sprinkle with dill. Put the salmon fillets together with the skin side facing out. 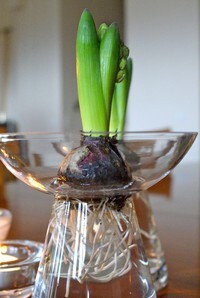 Store it in a plastic bag on a plate in the fridge for 3 days and turn it twice per day. 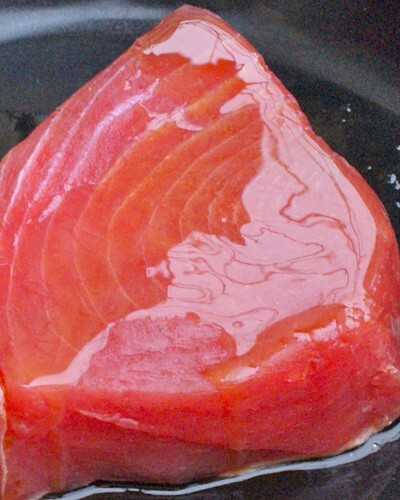 When serving, remove the marinade and slice the salmon into thin slices, carpaccio style. 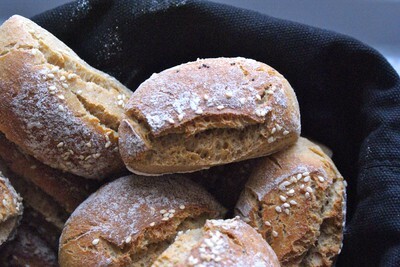 Serve it with a mustard sauce, freshly ground pepper, lemon wedges and bread. It turns out that this tiny seed is actually a nutritional powerhouse! 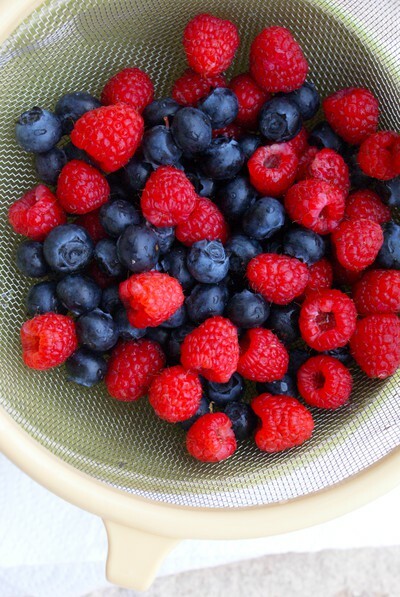 This super food is loaded with vitamins and minerals. 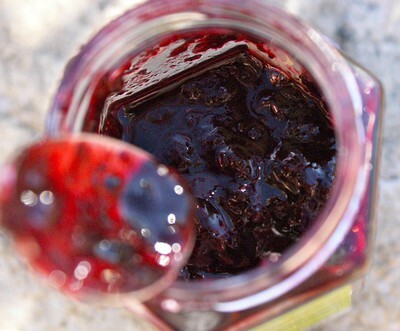 Specifically, it is a great source of folate, iron, magnesium and zinc. The fact that it has magnesium, copper and phosphorous means that quinoa is especially good for those that have migraine headaches, atherosclerosis and diabetes. When it comes to fueling up for exercise or dropping a few pounds, cooking quinoa really makes sense. 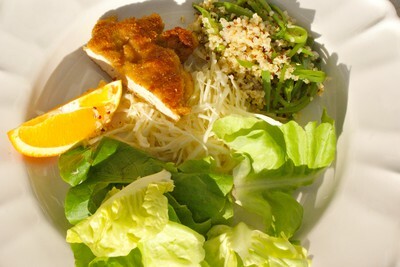 This is thanks to the fact that one cup of cooked quinoa has just 220 calories. 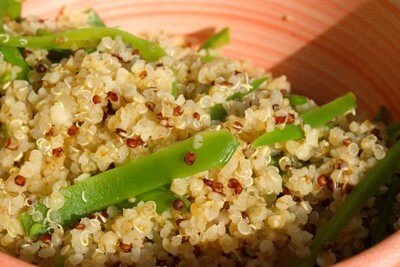 Quinoa is a great source of healthy carbohydrates, and also provides 5 grams of fiber and 8 grams of protein per serving. The last week we had a busy time as we were invited to parties and dinners. I didn't have much opportunity to cook and therefore I was not frequent on my blog. Today we are just relaxing at home. The weather is not inspiring for a walk and after a late dinner, by our neighbours yesterday night, it feels somehow justified to just relax and do nothing. 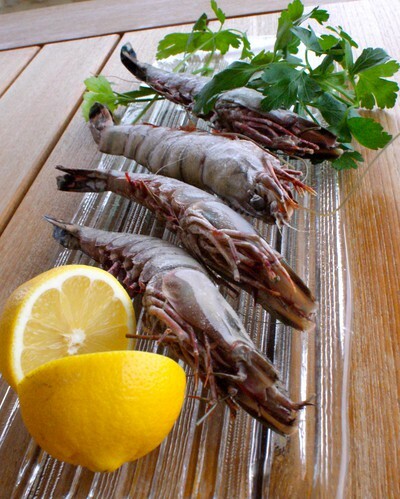 I bought yesterday fresh scampi on the market, which I will steam for lunch and serve it with a mixed salad. 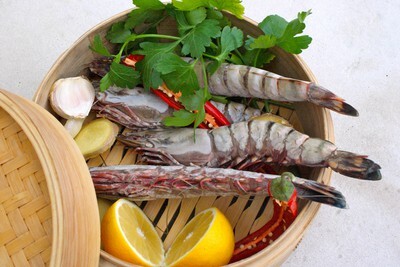 The bamboo steamer represents a very easy and healthy way of cooking. I have it in several sizes and use it frequently for steaming fish and vegetables. We went to Apt today for some shopping. What still surprise me in France is the access to all the fresh food here. You can buy fresh green salad year around instead of the plastic bags with wet pieces of salad you see in the supermarket. The berries I found irresistible today as well as the mango. All our shopping resulted in a very healthy meal today....and hopefully it strengthen our immunity system. We spent the whole morning to clean our house. Christmas is approaching and as we are awaiting M coming early next week, the house needs to be ready. 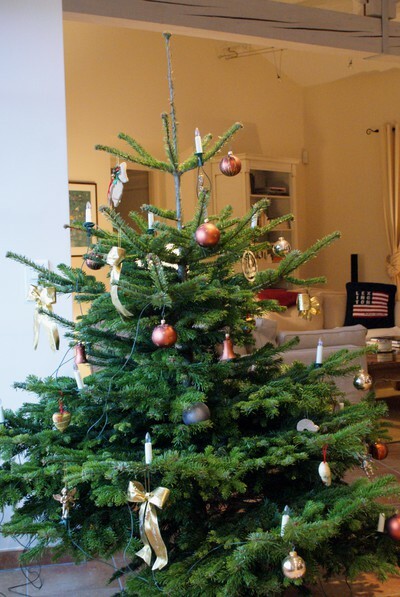 Tomorrow we will buy and decorate the Christmas tree and later in the afternoon we will enjoy a mullet wine party by our friends. On Saturday we have been invited for dinner to our neighbours and before that we would like to visit the church in Goult to lissen to Christmas gospels...these days before Christmas are so lovely busy, you know what I mean. 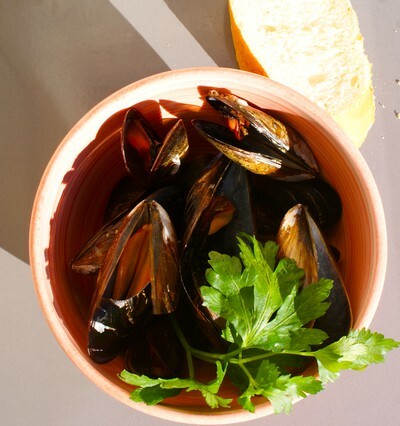 Today morning we had our last French lesson and on our way home we stopped at the supermarket and bought mussels for lunch. You just need to wash them. 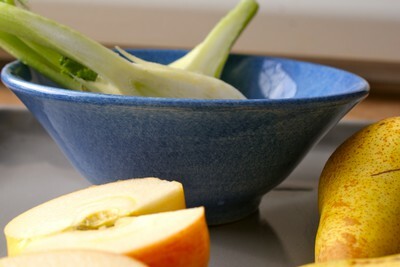 Then chop garlic, onion, celery and carrots and cook them in olive oil for a while. 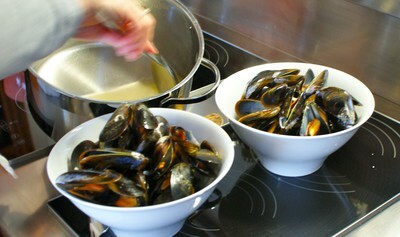 Add a little of white wine and when it starts boiling add the mussels. Put the lock on and cook for 3-5min until the mussels have opened. I served it with chopped parsley and with bread. 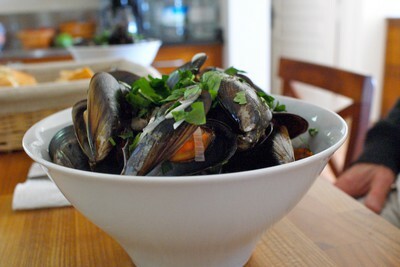 Mussels which have not opened after the cooking have to be discarded. I still do not have any enthusiasm to cook. This means that I am not fully recovered from the illness. 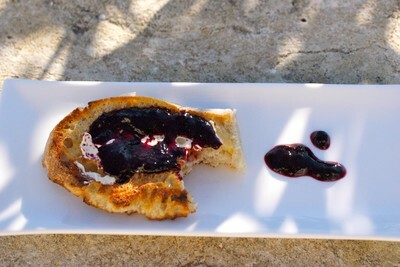 Yesterday we were invited to a lunch and as always in Provence the Sunday's lunches take at least 5hours. 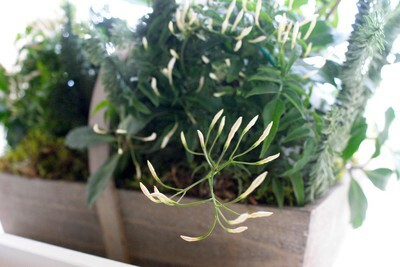 I do not remember when I latest enjoyed a lunch so much, charming company, good food and so we laughed. 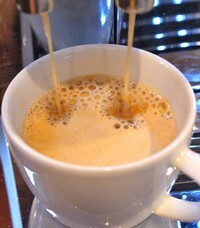 However, my stomach had a hard time during the night then. Today, Lucia day in Sweden, and here we have bright sunshine and blue sky. We decided to go for a walk to our hills. I have read that 20min walking burns 100 calories which means that I must have totally burned 700 cal. I do not believe that it is also valid for women above 50 because sometimes I make this hike 3-4 times per week, in parallel with eating healthy and I do not loose any kilos. Afterwards I enjoyed a bath, scented with lavender oil, a big bowl of fruit salad and a short nap on the sofa. After coming home from Paris our fridge was pretty empty. Furthermore we had Christine by us the whole morning and were busy with cleaning the house. 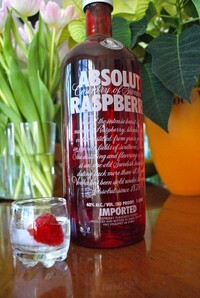 So what to eat for lunch? I always have food in my freezer as we live outside the city and have almost 40 minutes to drive to our nearest shop. 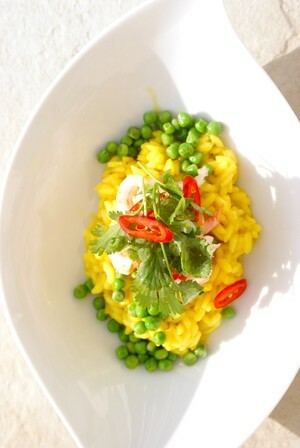 I cooked risotto on arborio rice by following the description on the package but I additionally spiced it with turmeric. Turmeric is often call "poor man's saffron" due to its colour, but it is an outstanding healthy spice. 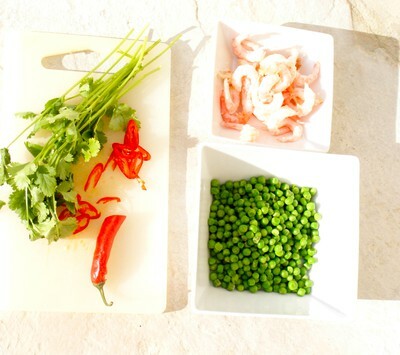 Then I defrosted green peas and shrimps, only with cold water without cooking, and served it with shredded red chili and coriander (which survived in the fridge during our absence). I also dropped over a little of avocado oil and press over a little of lime. 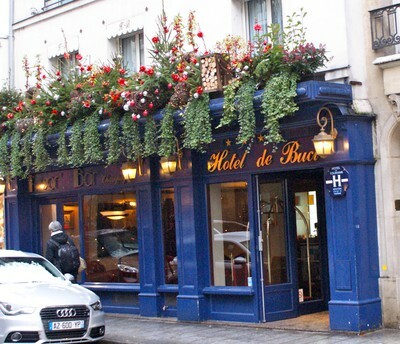 When visiting Paris, we usually stay at the Hotel de Buci, one of the few hotels on the Left bank of Seine. 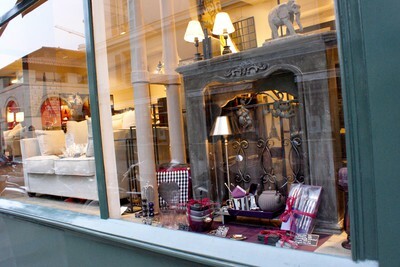 The location is perfect, in the middle of Saint Germain with walking distance to all these nice restaurants, bars, chic shops and art galleries. 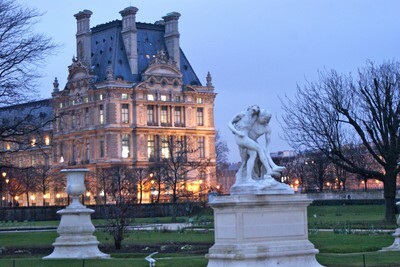 It is also close to Louvre and many of Paris' attractions. However, the rooms are small, very small and it doesn't come cheap. 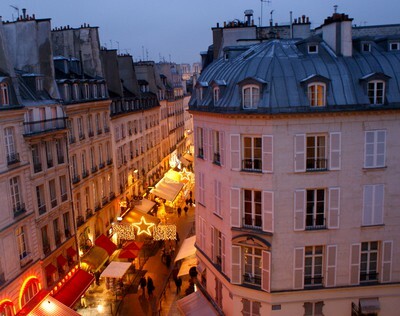 We like the atmosphere of the Rue de Buci and somehow it feels like coming to a second home. During the days we made long walks, we stopped for a coffee and cake, later for lunch and then walked again. 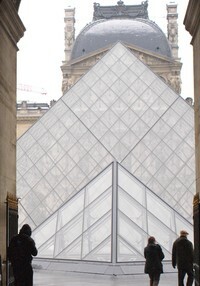 We made some shopping, visited Claude Monet exhibition in Grand Palais which was very special. I learnt that Monet was a very productive painter and often painted the same motif with different light settings. All these paintings have been now collected to this exhibition and you could see it all together. 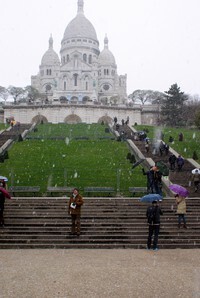 One day we walked to Montmartre and were surprised by snow. 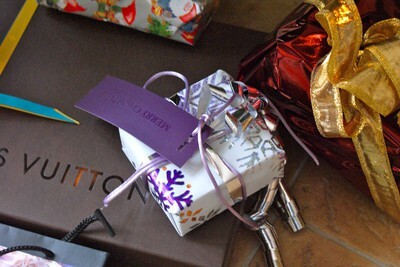 It was a real Christmas feeling. 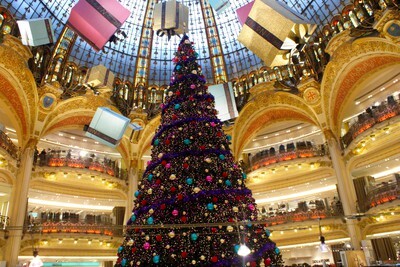 On our way home from Montmartre we shortly stopped at Galerie La Fayette and took this picture of its enormous Christmas tree. The store was so crowded, buses with people arrived all the time ......and we hurried out. Oysters were in season and we enjoyed them almost every day. 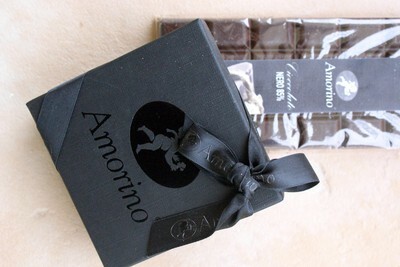 Delivered from the coast of Bretagne they tasted lovely and we completely fell in love with them. 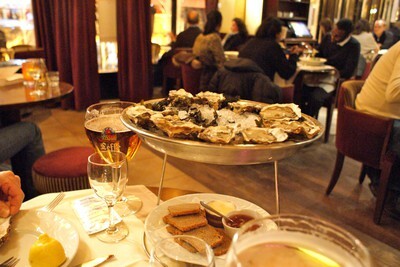 Otherwise the food at restaurants was a little disappointing but we have been also lazy and after walking the whole day we choose the brasseries on our street. Next time I will do more research about WHERE TO EAT. 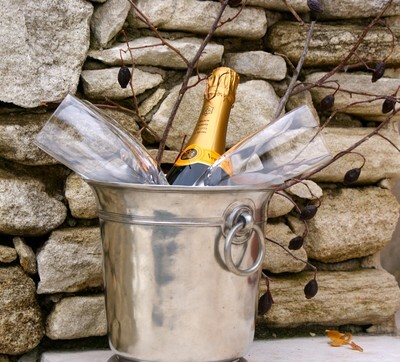 The sun is back but it is still unusually cold in Provence. 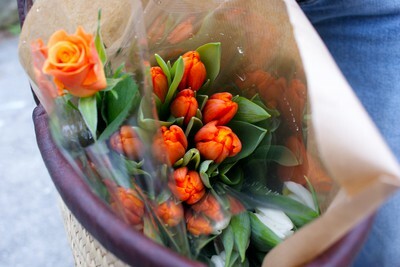 We went to the market today as every Saturday, for the coffee with friends and for buying the fish. 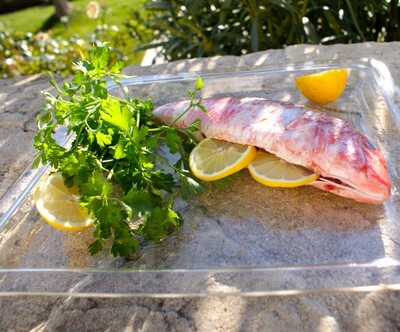 This time we decided for the mediterranean fish Rouget, the name comes probably from the color of the fish. 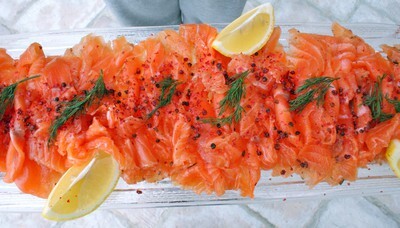 It will be a light dinner, roasted fish in oven with lemon, chili and garlic, a few potatoes and salad. 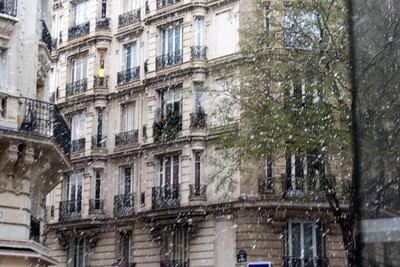 Tomorrow morning we go to Paris for a couple of days....no big plans just to enjoy the Christmas atmosphere in Paris, visit some museum and Claude Monet exhibition in Grand Palais, some Christmas shopping and of course a lot of comfort food and a few glasses of deep red wine for keeping the warmth. Today I invited our friend for a light lunch. He has recently been diagnosed by cancer and he is not very well. As he lives alone we take him often for lunch either to a restaurant or to us. He asked me if I could make pancakes to lunch today. I decided to serve a chicken soup as a starter, you know "chicken soup for the soul", and also for its nutrition value. I cooked half of the chicken together with carrots, parsnips, parsley, fenouil, ginger, onion and a piece of red pepper, chicken stock cube/powder, salt and pepper for 1hour on low heat. Then I cooled the soup over night. In the morning I collected all the fat from the surface and discarded it. 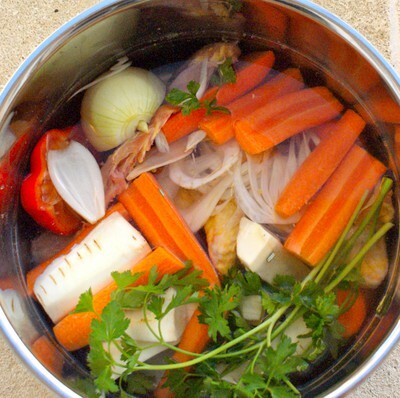 I strained the soup in order to separate the liquid from the vegetables, bones and meat. Discard the bones but keep the meat, cut in small pieces to serve together with the soup. Put all vegetables into a mixer and mixed it together with the strained liquid. Add 2 spoons of light creme fraiche and season with pepper and salt. I had still some of the parsnips left so I decided to do parsnips chips of it which I would then crush and sprinkle over the soup as a taste and decoration add-on. 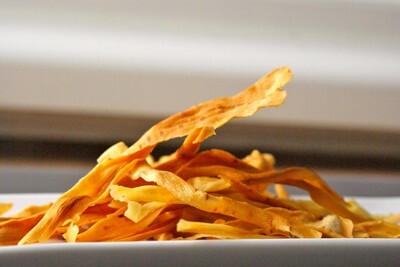 Peel the parsnips, slice them in strips and toss with oil. I have roasted them on a tray covered with baking paper for 2 hours at 100°C before golden crisp. 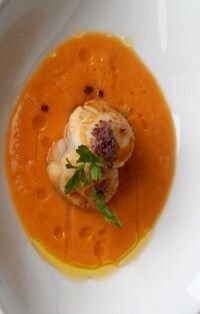 Fenouil is my favorite vegetable which I discovered only recently when I moved to Provence. 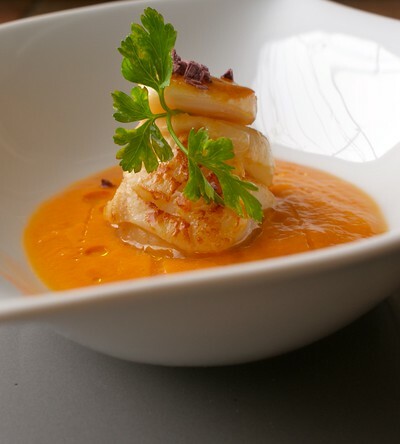 I make it often as a puree to accompany fish dishes. 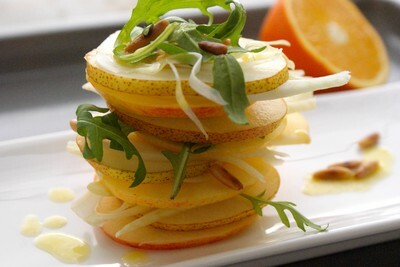 This salad is another beautiful utilization of fenouil together with pears, apples and rocket. 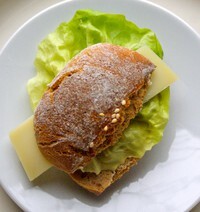 I made an italian dressing combining grated parmesan cheese, juice from orange and lemon, olive oil, salt and pepper. 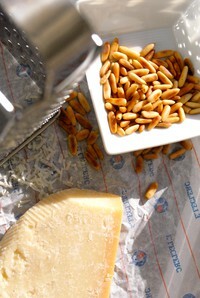 I served it also with roasted pine nuts and either a slice of smoked salmon or parma ham or as it is. 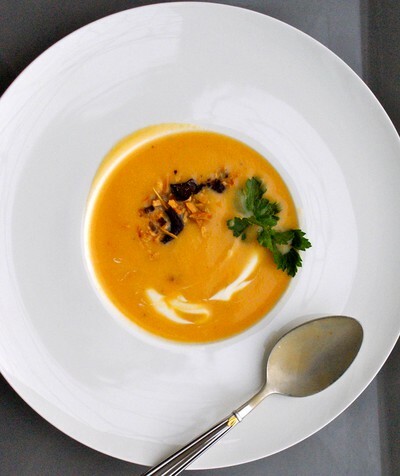 The pumpkin puree I made in the same way as the pumpkin soup but with less water in order to achieve the puree consistency. I mixed it with 2 spoons of light creme fraiche and added fresh grated ginger. 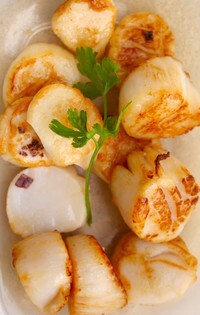 I used frozen scallops which I first defrosted during the night and patted them dry with paper before pan-frying them on each side. Then I seasoned them with salt and pepper. 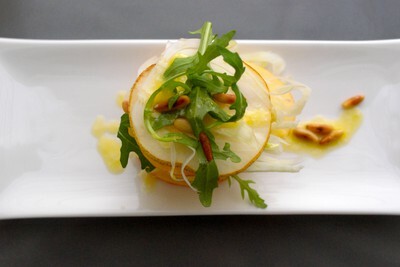 When serving I dropped over a little of truffle oil and decorated it with a few persil leaves. 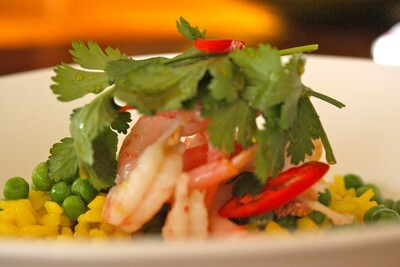 This dish could be served as a light lunch/dinner or as a starter. Both my husband and I myself like late mornings, which means to allow the body to take the time it needs to wake up... no rush, no timeline to meet. I assume that it is also related to our earlier professional lives when we both travelled a lot and therefore we appreciate every minute of this pleasure. The breakfast is another pleasant story and my probably most appreciated meal during the day. 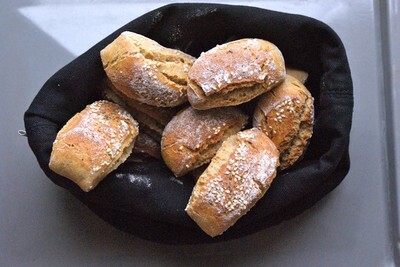 Today I made an exception and exchanged the muesli for fresh home-baked rolls to the breakfast. Together with fresh orange juice and a little pomegranate juice we also enjoyed a papaya fruit. It was so ripe and delicious and without knowing its origin I would not believe that it had to travel so long way. Vitamins....fibres...and also protein in form of egg, this is a good start for our bodies.